PAT HICKEY KNOWS MORE THAN MOST about Olympic corruption. He has seen it firsthand over the past quarter of a century. 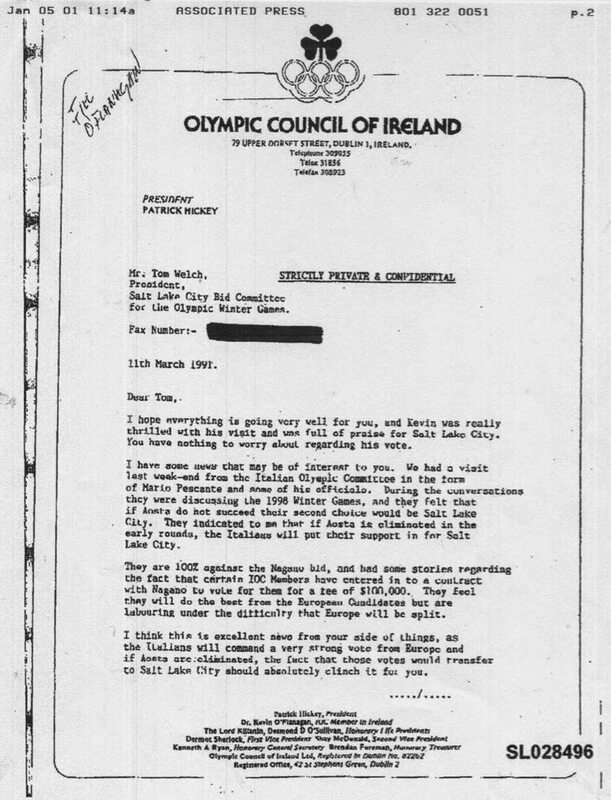 In 1991, when he was an official at the Olympic Council of Ireland, Pat learned that in the dirty fight to host the 1998 winter Olympics some IOC members were selling their votes to rich bidding city Nagano for $100,000 a time. We know this because in March 1991 Pat sent a letter marked “Strictly Private & Confidential” to the leaders of Salt Lake City’s rival bid for the Games. We obtained our copy from the archives compiled after Salt Lake’s bribes became public. Pat never reported the crooks and having proved his reliability, was elevated to IOC membership in 1995. Three years later the Salt Lake corruption scandal broke and several more followed quickly. 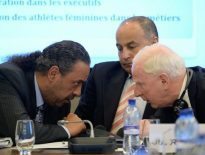 Pat Hickey was appointed to an IOC committee tasked with “reform.” Alongside him were members concealing histories of sports contracts kickbacks, hiding doping scandals and more bribe scams. As expected their “reforms” weren’t and the IOC carried on selecting themselves from people like themselves.Pat did have to face an election when he became President of the Olympic Council of Ireland in 1989 but, enjoying a novel constitution that gives his supporters extra votes, he is still in place. In his time Pat has threatened to sue most of the Irish media so they have made him a hero at home. Real power fell at Pat’s feet in 2006 when he won control of the little-known 49-member European Olympic Committees [EOC] and entered a new world of Gala Dinners. But he wanted his own Games. Asia had them, the Americas did, Pat must make a European Games his legacy. Problem was, nobody wanted them. The European summer is crammed full of elite sports events across the continent. Who could afford them, and where would the athletes be found? The democratic countries of Europe looked away, embarrassed. But there was one that wanted to divert attention from its ghastly human rights abuse and all-pervading dictatorship. The first clue to Pat’s plans came at the EOC congress in Istanbul in 2008. 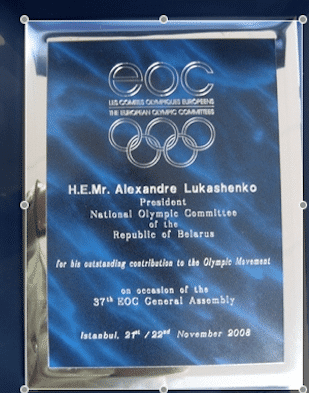 Without consulting his members Pat announced a special award to the president of the national Olympic committee of Belarus for “His outstanding Contribution to the Olympic Movement.” This was baffling because Belarus has inherited the former East German preeminence in doping its athletes. Every Olympics has its Belarusian scandals. It was the first at the London 2012 Games. This president’s day job was President of the Stalinist hangover of Belarus. When Alexander Lukashenko wasn’t setting his thuggish police on youthful pro-democracy demonstrators he wanted sports events. This impressed Pat Hickey who announced in 2011, “It is important that the National Olympic Committee in Belarus is headed by Alexander Lukashenko.” This did not impress the European Union who banned the thug from travelling. Hickey pondered the near bankruptcy of Minsk and looked south to where the black gold gushed. 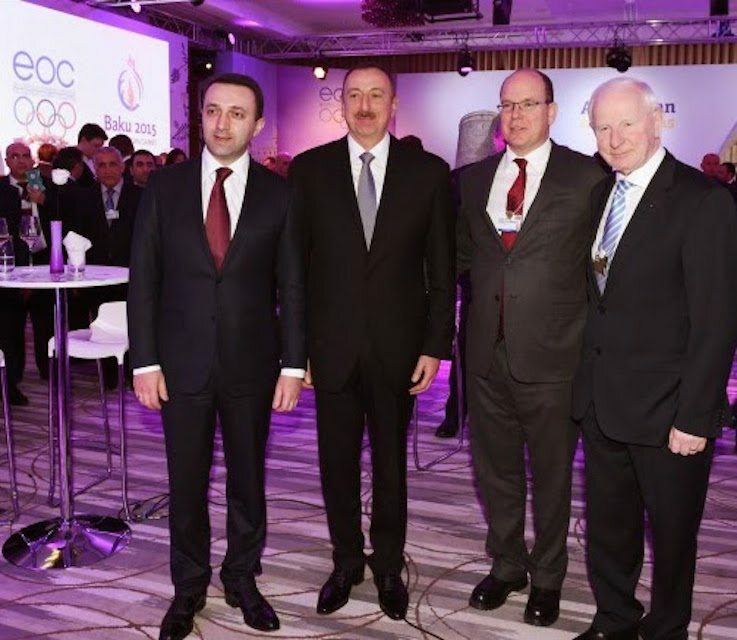 On 12 December, 2012, Pat’s EOC voted the first European Games to Baku. THE ALIYEV government embodies “organised crime.” Who says so? An American diplomat in Baku in a secret report to Washington in September 2009. He had consulted sources inside the government before writing a detailed – and sometime hilarious – description of how Mafia politics and business work in Azerbaijan. 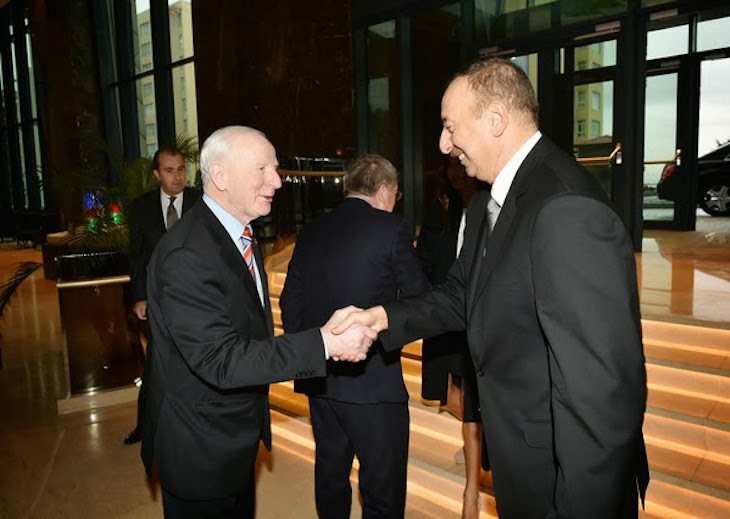 The report, circulated by Wikileaks, says President Ilham Aliyev is two men. “Michael Corleone on the outside, Sonny on the inside,” said the diplomat. The “Michael Corleone on the outside” in his tailored suits and speaking perfect English negotiates with oil corporations, throws parties at Davos with the IOC’s Pat Hickey and Prince Albert of Monaco cozying up to him and spends a fortune on massive international public relations campaigns to obscure his sordid “Sonny” image. He is also “a talented balancer of alliances.” That’s a polite way of saying that the spoils from robbing the state and its vast oil wealth are shared equitably between the leading Families – including the First Lady’s clan, the Pashayev Family, said to be the most powerful commercial family in the land. Pat Hickey and his desperate need to overlord a European sports event ticked all their boxes. 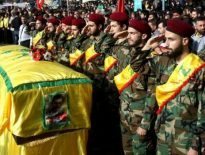 It would be immensely profitable for the families and generate warm soft images with the pliant international sports press as he bowed and scraped to Mehriban. Meet Azerbaijan’s First Lady, president of the Heydar Aliyev Foundation, UNESCO Goodwill Ambassador, chair of the Organizing Committee of the Eurovision Song Contest, winner of the 2014 “Olympic Excellence” Special Honorary Prize of the International Olympic Academy for promotion of Olympic values, vice-president of the Azerbaijan National Olympic Committee, Member of the Azerbaijani Parliament, vice-president of the ruling YAP – Yeni Azerbaijan Party – (take breath ) . 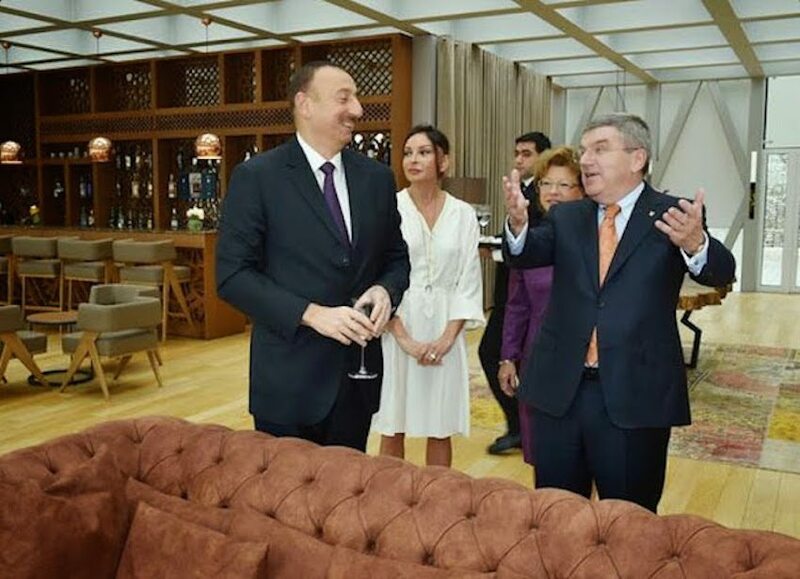 . . Chairperson of the Baku 2015 European Games Organizing Committee, Mehriban Aliyeva, neé Pashayev. Mehriban and Michael – and sometimes Sonny – live well, according to another Wiki-leaked US embassy cable. 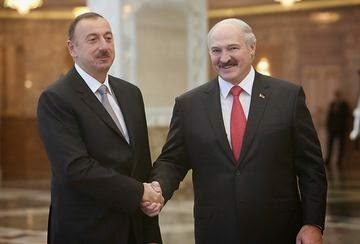 “There appeared to be an eerie sense of disconnect between President Aliyev’s personal, private residence and the socioeconomic conditions for average Baku residents,” reported the ambassador in 2007. He and other diplomats were taken aback at the “ostentatious display and opulence” at the ruling couple’s beach-front dacha with its “stunning” views of the Caspian. It was prescient of Mehriban to take the Presidency of the Azerbaijan Gymnastics Federation in 2002. These Games feature Rhythmic and Artistic Gymnastics in the spectacular new National Gymnastic Arena, described by the Financial Times as “a delightful essay in architecture parlante,” built by Pasha Construction. Yes, its her clan and their conglomerate includes several banks, including Pasha Bank, Pasha Insurance, a TV station and much, much more. They are probably the richest tribe in this land, the size of Ireland but with twice the oil of Texas. THE FIRST LADY’S PROPAGANDA MACHINE is driven from a substantial, detached redbrick house in the pleasant Buckinghamshire countryside to the north of London. 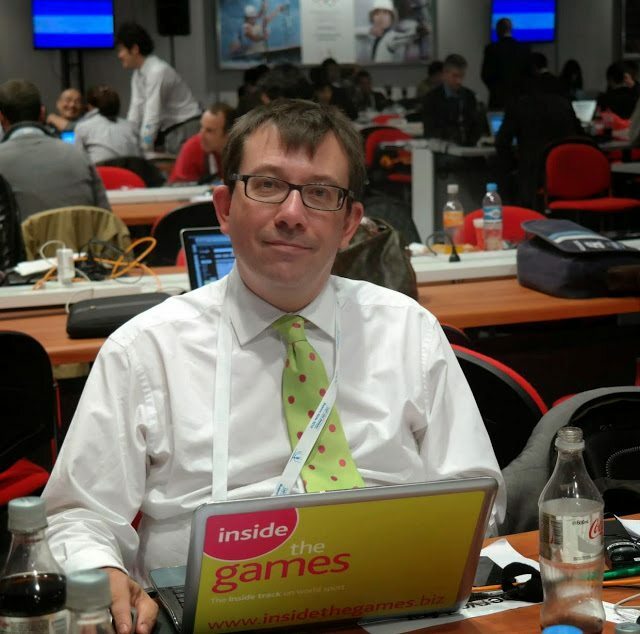 Former Guardian athletics reporter Duncan MacKay was declared bankrupt in 2010 for unpaid billson a previous sports website but has recovered to build an empire of interlocking online publications. They generate remarkably favourable coverage of the International Olympic Committee, its wealthiest individual member, cities hoping to host Summer and Winter Games and martial arts federations. And the Corleones of the Caspian. Another man without blemish on his character is bulky Sports Minister Azad Rahimov who cannot help looking like the last person you would want to meet in a dark Baku alley. He is the man “entrusted with delivering history.” He “encapsulates the ‘can do’ spirit pervading the organisers” and “Over the past 10 years, 35 Olympic sport complexes have been built.” In his 565 words there’s no space to examine who got the contracts. By the time the weary Mr Mackay encountered the First Lady, he had long stumbled into the language trough of Pyongyang. The saintly Mehriban gets the most words – 774 – but even less is said. Gymnastics is mentioned but she seems to lack passion. She cherishes her membership of her country’s national Olympic committee. She helped build the Baku Museum of Modern Art – but the contractor who got the work isn’t credited. Her sculpted face and frame are lovingly portrayed. With seemingly unlimited funding Mr Mackay hires young and as yet unformed reporters to eulogise the Olympic industry as it would choose to be reported. He also employs a team of semi-retired British sports reporters whose upbeat reporting from the luxury hotels of Baku does not extend to mentioning their colleagues in the Kurdakhani jail. WHAT BINDS THEM TOGETHER is their career-long admiration of the also unblemished Lord Sebastian Coe. They created a sports industry-wide attitude that the former runner, Tory politician and now multi-millionaire is, with the First Lady, stratospherically above any criticism. Lord Coe shares her enthusiasm for this summer’s seaside spectacle. 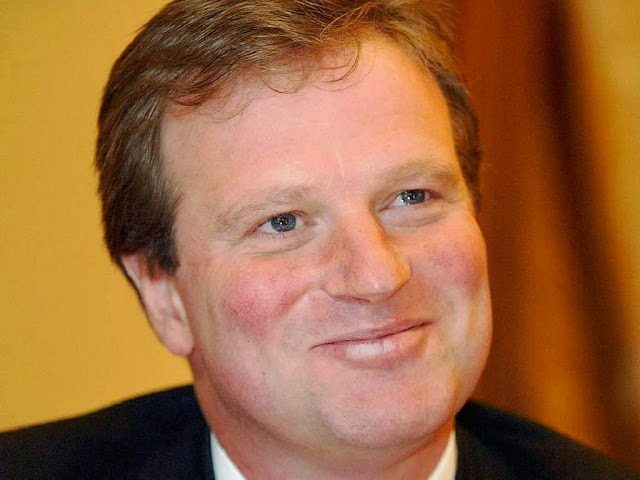 In October 2012 he was appointed chairman of CSM strategic, part of the Chime communications group – a cluster of PR companies and event managers with more than 1,700 employees – receiving a “golden hello” of £1.9m in cash. His salary is £350,000 and the Financial Times estimates that this year he will earn £2.5 million from his various business interests including £300,000 a year as an “ambassador” for Nike. 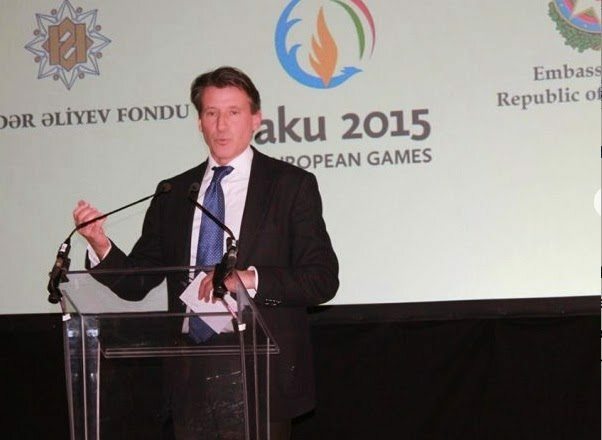 Lord Coe was elected chair of the British Olympic Association in November 2012 and the following month represented British sport at the vote on Baku’s application, created by Chime, to host the European Games. Chime is at ease with the Caspian Corleones. 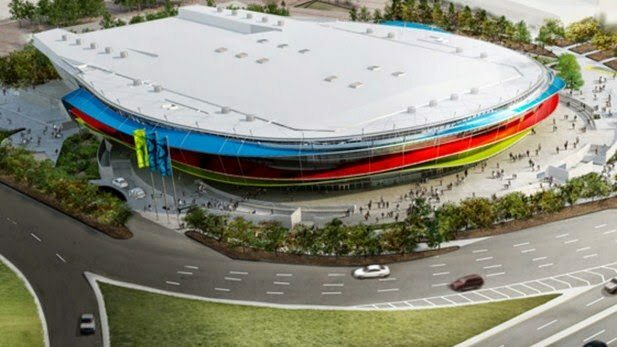 The clans wanted to stage the 2020 Olympic Games and Chime wants us to know that they “led on the development of the Applicant File; brand positioning, narrative and messaging and assisted the Baku 2020 team with its interaction with and presentations to the Olympic Movement.” Baku lost. ALONGSIDE LORD COE helping create a warm, friendly image for the Corleones is Jon Tibbs. The website of his Tonbridge Wells-based PR company proclaims, “We shape opinions, change perceptions and we build brands whose values are recognised and respected.” One of Mr Tibbs’ staff – a “senior consultant” – is dedicated to working for Baku. Tibbs himself has been lowkey but he surfaced last November in Baku hosting a dinner for Olympic officials where IOC president Thomas Bach was seen to bow low to kiss the hand of the First Lady. Putin’s Crimea adventure undermined Mr Tibbs’ optimism about his client and he has moved Eastwards to speak favourably for Turkmenistan, like Azerbaijan another of the world’s most vile dictatorships. Also on the Turkmenistan payroll is Lord Coe’s Chime company and the noble Lord praises his client’s “great vision.” Tibbs’ pandering to the post-Soviet dictators brought him a Queen’s Award for Enterprise last year.